Confronting the anxieties in today’s workplace requires employees with flexible minds. An effective public servant should be multi-skilled with crossover skills to deliver government priorities. Baringo Campus Deputy Director in charge of Academics, Mr. Benard Anjili, said that to achieve this, there should be a conscious effort to identify one’s values. One should take time to understand their real priorities in life by embracing commitment and competitiveness which contribute to improvement. The Deputy Director added that discipline, diligence, and dependability are the real ingredients for a competent public servant. 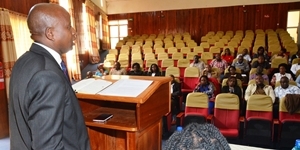 He made his remarks at the Baringo Campus while addressing the graduating participants of the Public Relations and Customer Care (PRCC) as well as the Management Skills Development (MSD) courses. 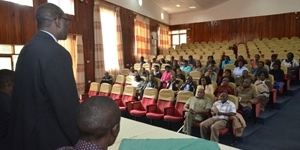 Mr. Anjili urged the officers to be firm, and not compromise work ethics. This requires identifying and following a new path, as he informed them of the different categories of learners and encouraged them to rethink where they fit. disrupt the occasion and Hostages who attend training against their free will,” he told them. Participants were challenged, especially those in the MSD course, most of who were drawn from the Kenya Revenue Authority (KRA), to enhance sensitization of the public on their services for good client relationship. “Demystify your services and inform the public on the importance of taxation, for instance, during open days and other reach out events. This is fundamental for good agency-client relationship and this, indeed, will enable tax compliance,” he said. The Deputy Director emphasized the importance of communication and collaboration in a way that ensures efficient and effective service delivery. According to him, transparency makes one credible. 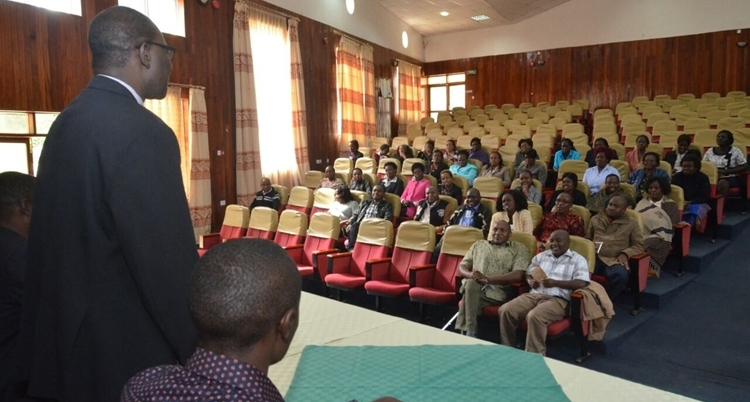 He reminded the officers to keep themselves abreast with the dynamic world and to take advantage of existing training opportunities offered by the Kenya School of Government. “There is a revolving fund for public servants offered by the Higher Education Loans Board. Learn to benefit from such avenues since these courses might be made compulsory going forward,” Mr. Anjili advised. KSG faculty members at a past curricula review and validation seminar. As part of the harmonization process of the School’s hitherto independent institutions with a variety of programmes, various teams have been set up to review, revise and harmonize the School’s curricula. One such group was in Baringo Campus to work on a number of programmes including Supervisory Skills Development, Public Relations and Customer Care, Executive Secretarial and Secretarial Management. The review has been identified as an important task that would enable facilitators consider ways in which the curriculum interacts with participants given the changing work environment, and revise it to reflect the current public service needs. Mr. Humphrey Mokaya, pointed out that the curriculum review evaluates its effectiveness after it has been implemented. As a learning and development institution, he noted, the School must continually review and revamp its products to fit the policy direction of government and address the changing demands of the customers. The reviewed curricula seek to focus on the training needs of a 21st Century workforce. “This is in line with one the School’s values of continual learning,” Mr. Mokaya told the team of officers drawn from all the KSG campuses who converged at Baringo Campus for this crucial exercise. also developed a new programme targeting top officers in government and state corporations referred to as Strategic Public Relations Course. Mr. Mokaya opined that the new programme assists to filter the emerging and contemporary issues in the public service and addresses the unique needs of the customers. 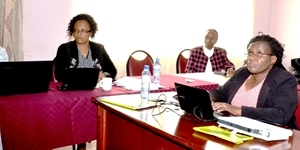 At the end of the review, the team proposed renaming of the Executive Secretarial Course to Advanced Office Administrators Course while the Secretarial Management Course is to be called Office Administrative Services Management Course. The review team comprised of Esther Gachango, Hellen Magolo, Alex Mirara, Patrick Gachagua, Aggrey Mudinyu, Nixon Madaraka, Teresia Mugendi, Evelyn Mathuki, Yophen Barongo and Virginia Ngoiboni.